Yet another creation of Dirk Kestelyn, Pascal Vasseur and Van Cauwenberghe in collaboration with http://www.Lotus-Forum.be (Belgian Lotusforum). For the 2016 edition we repeate the Ypres Lotus Day success story. With your Lotus we bring along the most beautiful spots around the Ypres region, nice roads are combined with cosy stops including the necessary snacks, meals and drinks. Once again “the Lotus event of the year”! 17h30 : Endpoint + reception [NO DINNER] & Dinner [ALL-IN] no dresscode! Tip: we have a FREE roadbook available in English, Dutch and French for anyone who is interested. If you come to Belgium for several days, then you can use this roadbook and make a nice tour and visit a lot of war monuments and nice spots allyound Ypres. 75 € (price per person (1p) payment only by bank transfer! 145 € (price per team (2p) payment only by bank transfer! Deadline payment : 01/05/2016 - Only payment completes your registration! You leave after the reception. 60 € (price per person (1p) payment only by bank transfer! 120 € (price per team (2p) payment only by bank transfer! Registration ONLY THROUGH this form. Double damn, in Spain. Maybe 2017. Written down on the calender! 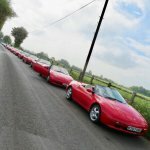 We shall be there ... More than 140 Lotus in a nice town. Thanks to our belgian friends, this is the place to be. Hello everyone , is it spring ??? Prepare the toys for the YLD 2016 ! May, 5th. Argh!.....it's the International Lotus Weekend at Brooklands, Weybridge 6-8the and I'm already booked in for that.......doh! You could easily do both G.